Larry Floyd Stahl was born on June 29, 1941 in Belleville, Illinois. The left handed outfielder was originally signed by the Kansas City Athletics in 1960. In 1964 he made his MLB debut as a September call up, and hit two HRs while driving in four runs in a September 29th game against the Minnesota Twins. 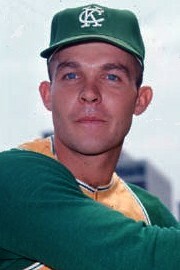 After another brief call up the next year, he got a chance as a regular outfielder for the 1966 Athletics. He hit .250 with 5 HRs 11 doubles & 34 RBIs. In the off season guys like Reggie Jackson & Rick Monday were brought up to the A’s team. Unfortunately for Stahl, he was placed on waivers. The New York Mets picked him up for the 1967 season. He made the club out of Spring Training, debuting in the second game of the season as a pinch hitter. He drove in a run in the fourth game of the Mets season, playing in left field in a 6-2 loss at Philadelphia. He struggled, batting .088 in early May & was sent down. He returned at the end of June, & began to get regular playing time. 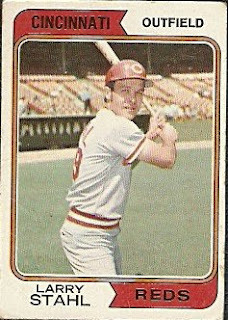 On July 13th, he hit a three run HR in Cincinnati off the Reds Don Nottebart, his first & only HR of the year. On the season he batted .239 with one HR, five doubles & 18 RBIs, while playing in 71 games as an outfielder /pinch hitter. 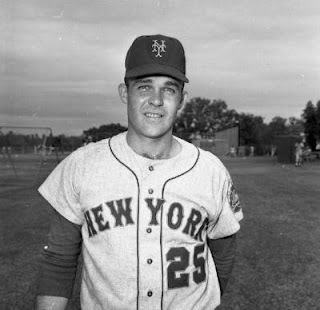 He began 1968 at AAA Jacksonville where he hit .366 before getting called up to the Mets again in July. He hit safely in 15 of his first 21 games, earning his stay on the club for the rest of the season. On July 27th, he hit his first HR of the year, in a 5-2 win over the Reds at Shea. He hit two more HRs that year, both coming in a home stand against the West Coast California teams. In 53 games played for the ninth place Mets, he had ten multiple hit games batting .235 with three HRs seven doubles & ten RBIs with a .318 on base %. 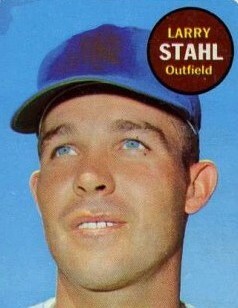 Stahl was chosen by the newly formed San Diego Padres in the 1968 expansion draft & would spend four seasons playing with the team. Although he hit under .200 the first two seasons he got a regular job playing in 114 games in 1971 batting .253 with career highs in HRs (8) doubles (13) & RBIs (36). In August of 1972 he helped team mate Nate Colbert tie Stan Musial's record of hitting five HRs in a double header. His two out ninth inning hit, gave Colbert the chance with another at bat in which he hit the record setting HR. 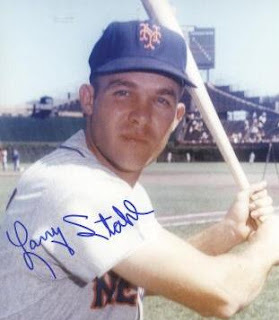 On September 2nd, 1972 Stahl came to bat in the top of the 9th inning, against Cubs pitcher Milt Pappas at Wrigley Field. Pappas had a perfect game going with Stahl representing the final out. With a two ball & two strike count, home plate umpire Bruce Froemming called two close pitches balls, resulting in a walk, ruining the perfect game. Pappas retired the last batter, preserving the no hitter. In 1973 he went to the Cincinnati Reds and appeared again at Shea Stadium in the 1973 NLCS. In Game #3 he singled as a pinch hitter off Jerry Koosman, two innings before the Bud Harrelson Pete Rose fight. In Game #5 he singled off a tiring Tom Seaver in the 9th inning but was stranded on third base as the Mets won 7-2 clinching the pennant. Stahl retired at the end of the season; in a ten year career he batted .232 with 400 hits 36 HRs 58 doubles 19 triples 163 RBIs& a .292 on base %.